The project seeks to prevent blindness due to diabetic retinopathy among people with diabetes in Uzbekistan. In Uzbekistan 80% of people with diabetes reside in rural areas where access to proper treatment of diabetes is lacking. Modern surgery can restore vision for 90% of people with early stages of diabetic retinopathy, but this treatment is not available to the majority of people with diabetes in the country. In addition, general practitioners lack the adequate knowledge of diabetes and its complications and qualified ophthalmologists and diabetic eye care facilities are virtually non-existent. The project is carried out with the support of the Ministry of Health in Uzbekistan. The project intends to decrease the number of people with partial or complete sight loss due to diabetic retinopathy by means of preventive measures, early diagnosis, qualified treatment as well as advanced training of general practitioners in rural areas and dissemination of knowledge of diabetes among people with diabetes. 1 ophthalmologist will undergo 2 months training at the Moscow Centre for Ophthalmology. The purpose is to have an eye specialist who is up-to-date on the modern techniques of surgical treatment of diabetic retinopathy. 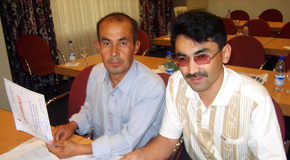 Upon return the ophthalmologist is expected to communicate the obtained knowledge to colleagues in Uzbekistan. Subsequently a 2-day seminar with participation of 50 ophthalmologists from each of the 14 provinces in Uzbekistan and the city of Tashkent. The focus will be on modern approaches to diagnosis and treatment of diabetes. In addition, 240 general practitioners are trained in prevention of blindness at a 1 day seminar. In each of the 14 provinces and in Tashkent diabetic eye care facilities will be established and equipped at the Regional Endocrinology Dispensaries. This capacity will link into the diabetes education centres which were established under WDF04-095. These facilities will screen people with diabetes for diabetes related eye disease. 2,080 people with diabetes will be examined in each of the eye care facilities. In Tashkent, a specialised national centre is set up to provide diagnostics and treatment of diabetic retinopathy. This centre will be used for referral of patients. The examination and treatment of people with diabetes will be free of charge. To raise awareness on diabetes a 10 minute video and a website will be developed with information on diabetes and its complications including diabetic retinopathy. Booklets, a methodological manual on prevention of diabetic retinopathy, medical cards, inventory cards and visual aids for people with diabetes and general practitioners are developed, published and distributed in both Uzbek and Russian. Finally, a conference on the topic "Prophylaxis of blindness in people with diabetes and current approaches in diagnostics and treatment of diabetic retinopathy" will be conducted with 80 ophthalmologist, endocrinologists and general practitioners from all over the country attending.